Weabers stand for Web Application Browser and Server It is a PHP and LUA enabled Webserver and Web browser combined into one single application. Weabsers let you run web based applications without a web server or a browser, just a single application to make your web based software look like a normal desktop application. 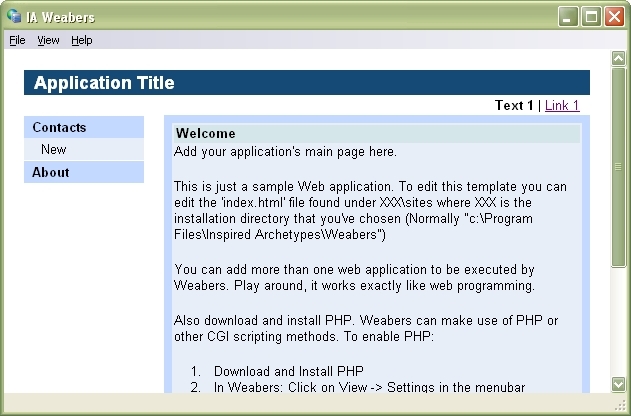 Weabers can be used as a execution framework for offline web based desktop applications. Design your desktop applications. ...... Add some AJAX concepts and execute it in Weabers. Qweas is providing links to Weabers 1.1 as a courtesy, and makes no representations regarding Weabers or any other applications or any information related thereto. Any questions, complaints or claims regarding this application Weabers 1.1 must be directed to the appropriate software vendor. You may click the publisher link of Weabers on the top of this page to get more details about the vendor.